Chief minister Mamata Banerjee today attacked the BJP-led government at the Centre by raising its alleged inaction in resolving the mystery surrounding the disappearance of Netaji Subash Chandra Bose and for inflicting demonetisation woes on the people and ruining tourism in the hills. Although Mamata's target was the Modi government, she utilised the issues to underscore the "insensitivity" of the BJP's ally in the hills, the Gorkha Janmukti Morcha. 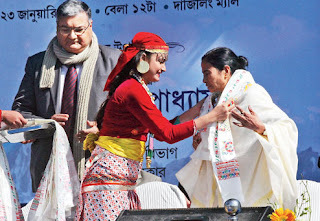 Trinamul insiders said, without naming the hill party, the chief minister had made it a point to "hammer in the fact that the Morcha was a party to the anti-people policies of the BJP government". Trinamul sources said it was also an attack on the Morcha, with which the BJP was preparing for a contest in the coming civic and panchayat polls in the hills. The sources said being a BJP ally, the Morcha would have to bear the brunt of the Centre's wrongdoings in the elections. "Did they (Morcha) hold any anti-demonetisation protest? Do they know how the tourism is affected in the hills?" asked a Trinamul leader. Speaking at an event at Chowrasta here to observe the 121 birth day of Netaji, the chief minister said she felt saddened that even after all these years, the facts about Netaji's death remained shrouded in mystery. "We know the births and deaths of all other leaders, but we don't know about Netaji's. The truth should come out and we want it to come out. We have made public whatever papers we had in our possession. The government of India also has papers and if proper investigations had been carried out, evidence would have come out. It has not happened till today. This pains me," she said. Netaji had a bonding with the people of the hills and was under house arrest in Kurseong's Giddapahar. Mamata took the occasion as an opportunity to praise the leader and his charisma. The chief minister said Netaji was the leader of the entire country who fought for Independence. "Netaji was the leader of the country. The leader of a country should be the one who is a leader of all the people - every community and all castes and creed - who does not make a difference (among people), and who takes everyone on board," she said. Her remark was seen as a response to Morcha president Bimal Gurung's attacks on her "attempts to divide the people of the hills by forming development boards" for different hill communities. Mamata, who has been very critical of Prime Minister Narendra Modi on the demonetisation drive, said even the tourism industry in the hills was facing the impact of the note recall. "I know Darjeeling is a tourist place. There are lots of hotels, shops and markets (that thrive on tourism), but because of demonetisation, there is a loss (of business) now. The purchasing power has gone down. The economy has gone down," she said. The attack on the BJP appears to be part of Mamata's strategy to compliment the populist measures like setting up of development boards. She today announced more funds for different development boards. "I am very happy that the 12 development boards are doing a good job. They have built over 11,000 houses. If they keep working properly, we will give more funds. I have already given Rs 300 crore to the boards," she said.